Honeycombs are remarkably symmetrical. Each little cell is a perfect hexagon – and all bees build this way. Why? Because of mathematics. NPR’s Robert Krulwich wrote about this in a recent post on his excellent science blog, Krulwich Wonders. I think the explanation is an amazing example of how the natural world often follows mathematical rules perfectly. 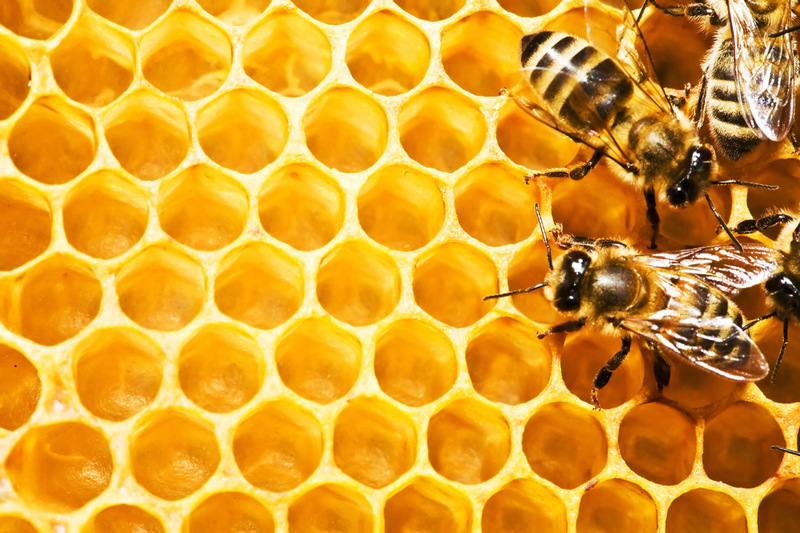 Thousands of years ago, an ancient Roman scholar named Marcus Terrentius Varro conjectured that the hexagon is the shape that most efficiently breaks flat space up into little units – making honeycombs that hold the most amount of honey while using the least amount of wax. He couldn’t prove his idea, though. It remained a conjecture until 1999 when a mathematician named Thomas Hales finally proved it! You can read a summary of his proof here. Or, watch this snippet about bees and their hexagonal honeycombs from the BBC. Want to learn more about hexagons? Here’s a website devoted entirely to the geometry of hexagons! Speaking of hexagons, have you ever played the game Hex? It’s a two-player game in which players take turns claiming hexagons on a hexagonally-tiled board, trying to create a connected path from one end of the board to the other. You can play it by hand using a sheet of hexagon graph paper, or you can play against a computer online, here. Enjoy! 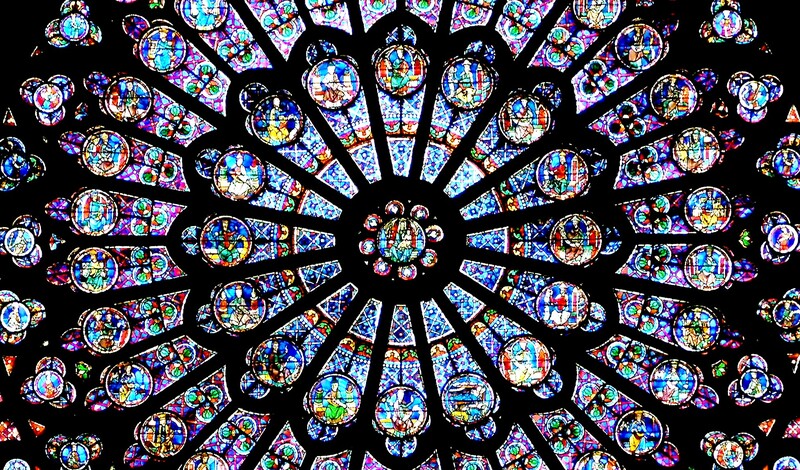 This stained-glass church window is an example of sacred geometry. Bees aren’t the only animals who use symmetry in the things they make. Humans do, too – especially for spiritual purposes. Humans have been in awe of the symmetrical laws that seem to govern the universe for thousands of years, and they’ve developed a type of artwork called Sacred Geometry, a way of thinking that gives spiritual significance to geometric shapes. 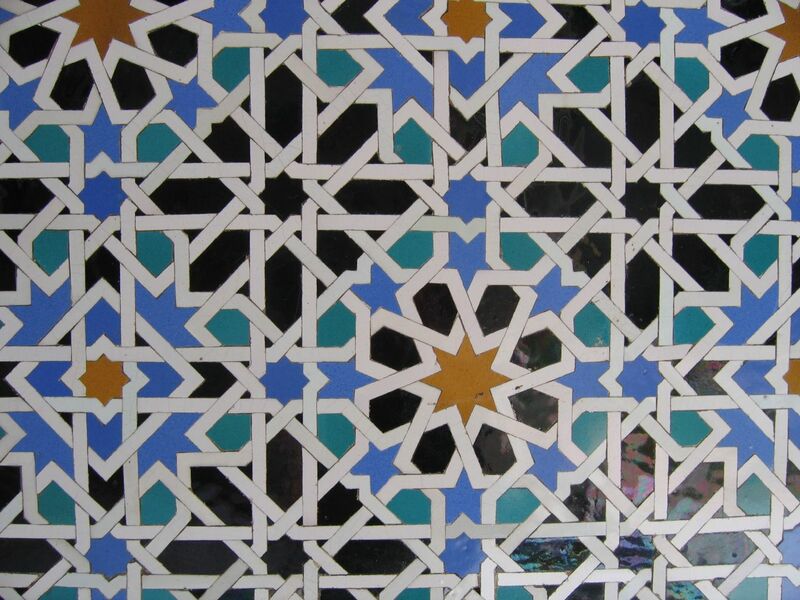 Sacred geometry can be found in religious artwork from many different cultures, and often uses tilings of regular polygons, the Platonic solids, and interlocking circles arranged in symmetric patterns. Mathematical artist Mark Golding has been making modern works of sacred geometry art of his own. His works are inspired by mandalas, Hindu and Buddhist spiritual symbols that represent the symmetry in the universe. The image to the right is called, “Inner Relationships.” It shows an octahedron, one of the Platonic solids, nested inside of a snub cube, which is made by chopping off the corners of a cube. I love how it demonstrates the symmetric relationships between these two shapes. If you’d like to see more of his work, check out this online gallery. P.S. – You may have noticed a new link off to the right at the top of the page. The Math Munch Team is proud to announce that our TEDx NYED talk has been posted online! We’re honored to have been invited to participate in this event with many other creative and accomplished educators – and we encourage you to watch the other talks from the day, too. P.P.S. And if you’re in the mood for some more TED-style math inspiration, you might enjoy these miniTED talks about math by some of Justin’s seventh graders. I, too, was intrigued by Robert Krulwich’s story. After following the comment thread, and doing some research myself, I found out that honeycomb cells don’t start out hexagonal! For a home-spun visual on how they begin, and a net (pattern) to make your own honeycomb cell, visit http://bit.ly/12l1MuQ. So cool. Love, love, love! I can so relate with Marjorie Rice; lacking a background in math doesn’t mean you cannot find a fascination with it. Reading Michael S. Schneider’s book “A Beginner’s Guide to Constructing the Universe” gave me my push start. Reblogged this on Math Education Concepts. The hexagon is an interesting shape. its use as a structural base is amazing. Expecially in the bees hive and graphene. This was one of the most interesting math munch videos I’ve i ever watched. WOW i never new that bees made that hexagon shape. I thought that people made those. And bees chose that hexagon shape because it takes up not as much bees wax as a triangle. A square would work but a hexagon fits the bees body a little better and a circle has space between. So the only one that works is a hexagon. I really enjoyed this video. Parts of the video confused me, like how they don’t make circles out of the wax, because their bodies would fit perfectly. Also I thought triangles would take up less wax than the squares. The squares would leave No extra room like hexagons. In the end, hexagons left less room. I still wonder how they make perfect hexagons??? this video is intrigging because i never new that bees had to make hexagons because bees need to put as much honey as they can without putting a lot of wax . circles wouldnt work because the circles would have gaps.how do bees have the noledge to figure that hexagons would be perfect cells to store the honey? I loved this video! It was so interesting to learn about why bees make their cells out of hexagons and noting else! And about those equations that that man was writing… I would love to learn what those mean and how I could solve them. I think I saw a lot of the things we have been learning in math class like square root, exponents, and order of operations! So overall, I feel that I have learned a lot of things from this video and I will use this knowledge about honeybees to learn more about how they make their, hexagons, and so many other things! I think that it is so cool how math can explain nature. I always seem to forget that shapes are a part of mathematics, too. I never really thought about how bees made their honeycombs, and this video explained a lot. I find it very interesting that bees just instinctively know how to bulid the hexagons. But since they used as little wax as possible, would the honeycomb break, or is bee wax a very strong substance? I would also like to know why the triangle formation takes up the most wax. Overall this video was very enjoyable and I really liked it! Wow! I thought it was amazing how the bees know which shape out of the square, triangle, and the hexagon took the least wax. I also thought it was genius how the bees know how each honeycomb fits into each other and makes this pattern. I thought the triangles would take the least wax out of the 3 shapes, because of how many sides it has. It is interesting how the bees used their body to measure the size of each hexagon. Wouldn’t that mean almost every bee in that hive is identical in size because the hexagons were the same size? This video was spectacular i never knew bees can make such a perfect hexagon. In this video I think that it’s really cool how building hexagons is in the honey bee’s DNA. It’s amazing how they choose to make hexagons instead of any other shape. I am wondering who was the person that proved that hexagons use less wax and how did they come up with that formula that was shown? I have a question for Thomas Hales, what inspired him to delve into the matters of natural patterns and tendency’s? Does he have any relation to the Fibonacci sequence, or has he observed any other natural patterns? this video was really interesting because you can see how the bees make there honey. I didn’t get how the man was doing the problems and drawing honey holes of the bees and square shapes one but still this video was really interesting!!! This was an outstanding and unique. I just thought the bees created the hexagons for no reason, but today I learned something new about bees. The reason the bees built the honeycombs like a hexagon was it used less wax and it was create mathematically. How did Thomas Hales create the formulas? Wow! I always thought bees just made hexagons because they just did now I know its because they don’t want to used a whole lot of wax they want to use less but still enough to hold their honey. Its amazing how we can see math in everything in the world. I think this video is really interesting because, I didn’t know that a hexagon would use less wax. I think wax is what its called, anyway, I would have thought that the triangle would have used less wax and not the hexagon because the hexagon has like 8 sides and the triangle has only 3 so that’s why I would think that the bees would likely prefer the triangle but I guess I was wrong. Thanks a lot for arranging Natural Geometry, Hex, and Sacred Geometry.Awesome presentation with the Honey combs example.I think a society is also so much associated for the appliance of Sacred Geometry in every sphere of lief. We also use sacred geometry to make our products. Pingback: The Crystalline Field of Life: Pineal, Heart, Bubble of Creation!! | The Shift of Time and Energy! I learned that bees can make perfect hexagons that are exactly their size. And that bees are very smart about living. The hexagon is a good shape to use for tesselation. Thank you for posting the video about bees! I loved this video its amazing that the bees make perfect hexagons. But one thing I still wonder is are any other animals besides us and bees that utilize hexagons? Hi, Alex! I don’t know the answer to your question… I’m definitely going to do some research. Let us know if you find anything!